Now Availabe for Your Organization's Profitable Fundraising Needs! !Convient Frozen Delivery to your Organization's Front Door! 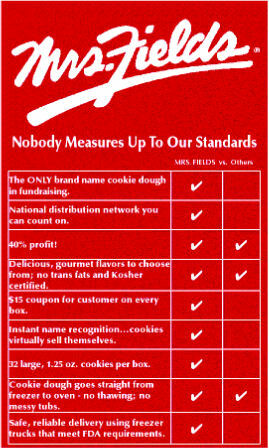 !Mrs Fields Cookie Dough - - - A Brand Your Organization Can Trust!!! Profitable Fundraising Ideas is proud to launch Mrs. Fields Cookie Dough as a Fundraising opportunity to earn money for your organization. 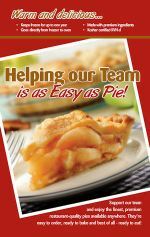 Mrs. Fields Cookie Dough name brand recognition combined with your sales expertise provides a winning recipe for fundraising success! Prove it to yourself, present the product to a school or organization and see for yourself how Mrs Fields Cookie Dough is the absolute ultimate in cookie dough!! Mrs. Fields® Cookie Dough is prepared with wholesome, premium ingredients, are trans-fat free, Kosher certified, and comes in boxes of 32 conveniently pre-portioned cookies! Just place and bake for an absolutely scrumptious cookie experience! Our frozen program offers your selection of pack-for-seller convenience or higher-profit bulk ordering. Orders are shipped frozen to your organization typically within two to three weeks of us receiving your order. Safe, reliable delivery using freezer trucks that meet FDA requirements. We’ve been baking cookies for over 30 years, and nobody bakes them better. Irresistibly soft and luscious, they’re made from Mrs. Fields® very own recipes using real butter, whole eggs, pure vanilla, and our special blends of flour, sugar, and chocolate. attraction comes in two sizes: our classic 3″ cookies or Nibblers® bite-sized cookies. Either way, every cookie gift is a tempting assortment of flavor favorites, from chocolate chip cookies to macadamia nut, carefully packaged to preserve their oven-fresh flavor. More Good News About Mrs Fields Cookie Dough Fundraiser. . . Premium Quality you can see and taste There is simply no comparison, Mrs. Fields Cookie Dough bakes premium ingredients, of a custom blend of chocolate, vanilla and brown sugar that you can see and taste with every bite. Each Cookie is made with 50% more particulates – the "goodies" in the cookie – than the next available fundraising cookie. 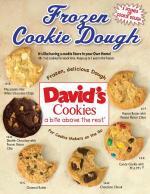 The result is better-quality cookie dough, which is why Mrs Fields is #1 in customer satisfaction. Call 800-515-0863 or click the link below to use our convenient online form.